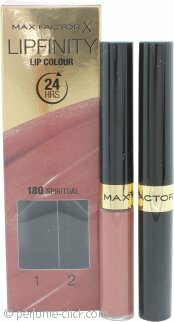 Lipfinity is a collection of long lasting lip colours by Max Factor. The revolutionary formula ensures that the bold and daring shade lasts up to 24 hours on your lips in just two simple steps. The product comes with a lip colour and a top coat. You do not have to re-apply the colour, however, you can use the top coat to ensure that your lips stay hydrated and that the colour stays fresh throughout the day. The first range of Lipfinity products were launched in 2000 with a promise to last up to 12 hours. Since the formula has been improved, its longevity has drastically improved.